The weather over the last two weeks has been very favourable. That is to birders. Seabird enthusiasts to be exact. July is fast becoming a very important month in the birding calendar for finding rare seabirds in the south west. Cornwall, Devon and even Dorset have been rewarded with some exceptional sightings. I say "even Dorset" as this county is not renowned for rare seabird sightings, but a Great Shearwater normally seen off Cornwall and Devon coasts, gave stunningly close views off Portland on the 26th. Many experienced Dorset birders had not previously seen this bird in their county. The highlight for Devon was the county's 5th Fea's Petrel, video'd off Berry Head, South Devon on the 11th July. This species breeds in the eastern Atlantic islands and just a handful of birds are seen annually, usually off Cornwall, Scilly or south west Ireland. Off Scilly, the famous summer pelagic boat trips on the Sapphire boat have logged several rare Wilson's Petrels, most offering close views. On 27th an incredible 20 were logged. 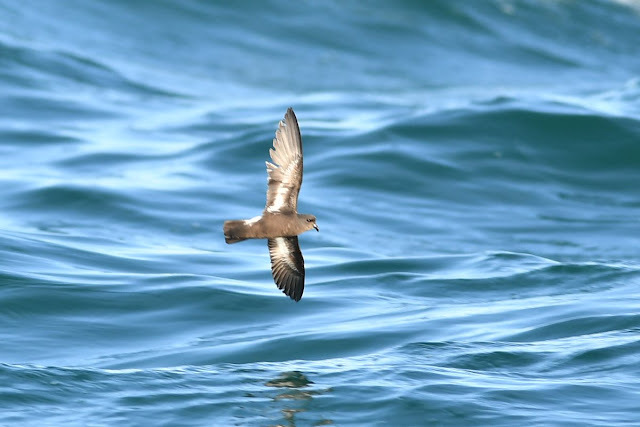 Cornwall has had its fair share of rarities though with six sightings of Wilson's Petrel (three from pelagics out of Penzance), the others from the Lizard and Porthgwarra. The Lizard scored well on the 21st July with 296 Cory’s Shearwater, 66 Great Shearwater, 9 Sooty Shearwater, 1 Balearic Shearwater, 1 Long-tailed Skua, 1 Pomarine Skua, 6 Great Skua, 2 Arctic Skua, 109 Storm Petrel, 1 Wilson’s Petrel and 1 Sabine’s Gull. Arguably, the best day was Saturday 22nd July when a strong candidate for Scopoli's Shearwater was seen off Porthgwarra. If accepted, this would be the first record for Cornwall. 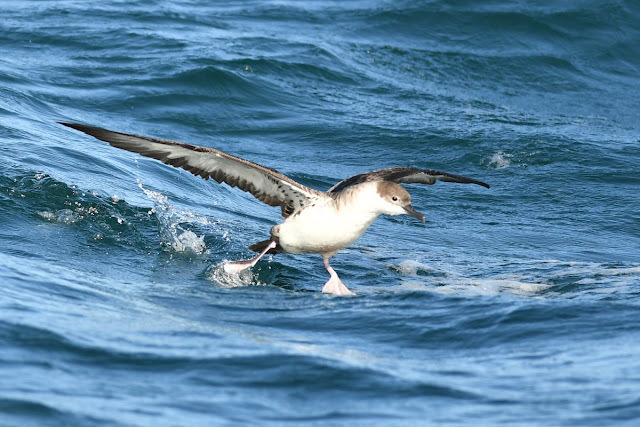 Depending on who you talk to, Scopoli's has not been granted its own status, rather a sub species of Cory's Shearwater. The small size, different underwing plumage and geographically distant breeding populations will surely see a status change soon. 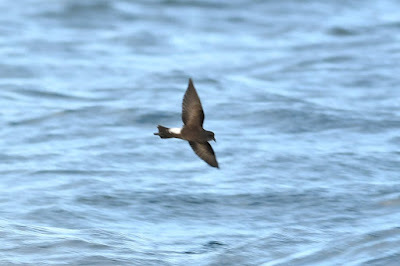 A large all dark petrel was seen by one lucky observer later in the day from the same site. Looking forward, August is equally a great month for seabirds and all eyes will be on weather forecasts for those big Atlantic low pressures. We will also start to see the southerly movement of waders as they move out of their Arctic breeding grounds. All in all, a busy time ahead. On Thursday evening on the 6th July, west Cornwall birder Mark Wallace found the rarest bird of his career so far. A regular walk after tea down Bosisto Lane chanced upon the county's first ever Amur Falcon, a small falcon displaced thousands of miles from where it should be. After some discussion and checking of photos, the bird was identified as a first summer female (i.e. a young bird no more than a year old, aged by the heavy wear to the flight feathers and scapulars). The news was duly relayed and a few locals connected that evening. At first light on Friday (05.38) some 200 of the UK's keenest assembled for a sighting. They were not disappointed as it was found roosting in a bush by the side of the road near the disused quarry. It remained at the roost site until 09.20 when it flew off towards Nanjizal. It was briefly seen in flight at 11.03 and that was the last sighting. The key question is how did it find its way to west Cornwall? One will never know for sure. One theory is that it could have hooked up with migrating Red-footed Falcons coming out of Africa and wandered with them in to western Europe. Given the high number of vagrant Red-foots in the UK alone, its a plausible theory. The record is the first for Cornwall and only the second for Britain, following a male in Yorkshire at Tophill Low from 14th Sept to 15th Oct 2008. This bird was misidentified as a Red-footed Falcon throughout its stay and was only identified retrospectively in photos. The species breeds in south-eastern Siberia and Northern China before migrating in large flocks across India and over the Arabian Sea to winter in Southern Africa. The route that they take from Africa back to their breeding grounds is as yet unclear. 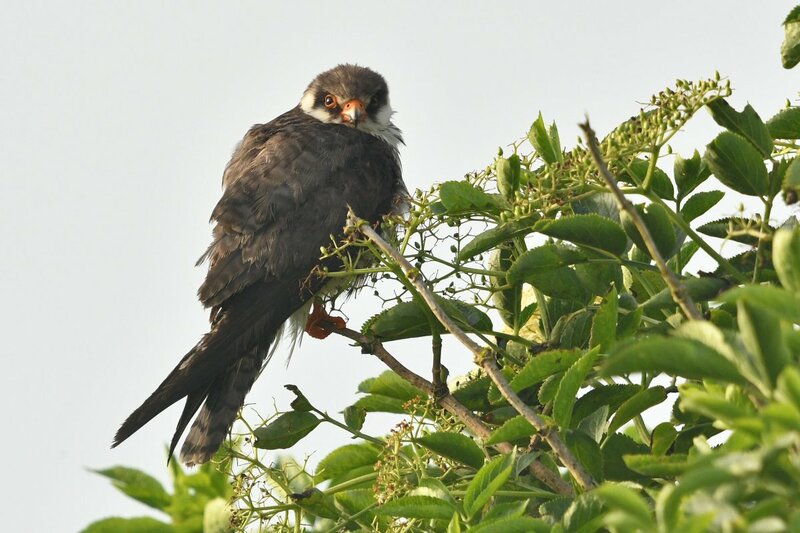 It was earlier treated as a subspecies of the red-footed falcon (Falco vespertinus) and was known as Eastern Red-footed Falcon. Completely unexpectedly, the bird was re found on Monday morning (17th July, ten days after it was last seen), by Jean Lawman in the St Buryan area. She was reasonably sure this was the same bird that she had seen many photos of. A phone call to John Swann led to Royston and John Ryan checking it out. After some searching it was refound and confirmed at 12.35, again at Crean with two Hobby's at 13.05, then back at the Crows-an-Wra substation at 17.15 til dusk. In the intervening period, there were also two unconfirmed reports at St Levan and St Gennys. 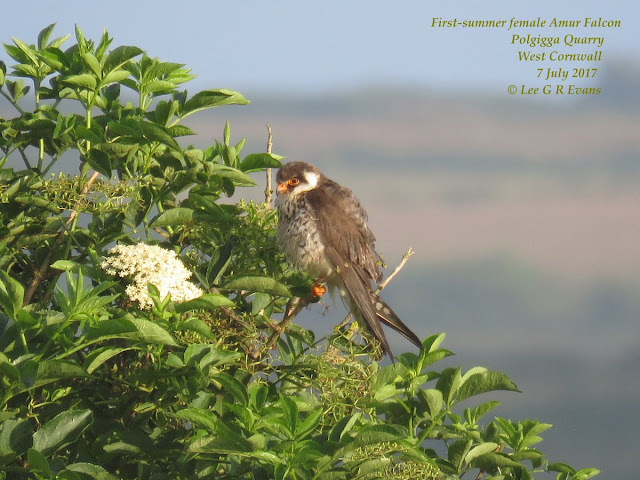 First summer female Amur Falcon, Steve Rogers. The last couple weeks of June has seen some variable and extreme weather. High temperatures reached that of the famous '76 summer peak of 35 degrees. The latter part of the month saw heavy rain. A change of weather usually means a change of birds. And June didn't disappoint. The highlight of the month goes to the Elegant Tern, first appearing in a tern colony in Hampshire at Hayling Island on the 7th June. The bird was wearing colour rings which proved it to be the same bird as seen on the French Atlantic coast since 2002. It was trapped and ringed in Gironde in July 2003. The first British record was at Dawlish Warren in May 2002. The records quite likely to refer to the same bird, which has also been seen in southern Spain and twice in South Africa! To the delight of Dorset birders, it was relocated at Brownsea Island on the 21st June. (There are three other yet to be accepted records in the UK). Remaining with the seabird theme, Cornish sea watchers have been rewarded with early sightings of some of the rarer shearwaters including Cory's Shearwater (breeds in the Mediterranean and Canary Islands), Sooty Shearwater and Great Shearwater (both breed in the South Atlantic). Several Wilson's Petrels have been seen from specialist pelagic trips from Scilly and SW Ireland. The latter three species have already bred during the south Atlantic summer and are now migrating north on circum-polar route covering eastern North America and then south via the Western Approaches. Cornwall and Scilly are thus perfectly geographically positioned to see these birds. Depending on wind direction and strength, Porthgwarra, Cape Cornwall, Pendeen and St Ives are ideal sites to see them. Disappointing news has been announced by the RSPB this week. The rare and protected Hen Harrier has declined considerably and is on the brink of extinction in England. Just four pairs bred in 2016. The reasons are habitat destruction and persecution by game keepers on grouse moors. Hen Harrier retains a foothold in Scotland Ireland but even here, numbers are in decline. The last pair to breed in Cornwall was way back in 2002 when three young fledged. How things can turn.